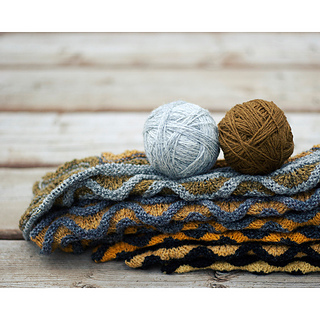 Inspired by traditional old shale patterning this shawl explores dimensional textured waves motif paired together with the 2 complementary gradient palettes. Completely reversible as you witness graduated color changes throughout. 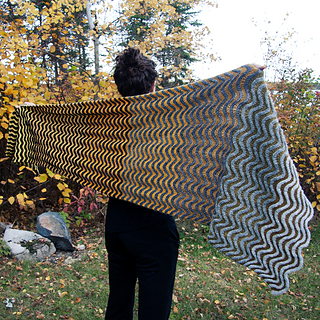 Slight optical illusion occurs as the size of each motif is progressively increased in width, helping to create this elongated trapezoid shaped shawl. Knit yours wide, wrap sized shawl, or narrow, for a scarf like accessory.